Bedding That Feels Good. Guaranteed. Every layer of your bedding is important. Before you layer your comforter and sheets on your bed, make sure you have extra layers of soft comfort beneath you on your mattress. One of those necessary layers is a bed topper. Here you will find our selection of Featherbed Mattress Toppers to add extra softness and support to your bedding. Available in a variety of options including duck fill and goose fill, here you will find what you need to make your bedding a soft, comfortable place to relax and get a restorative night's sleep. No matter how old or new your mattress is, you want to make sure you have extra layers of softness and support beneath you so you can get a quality night's sleep every night. 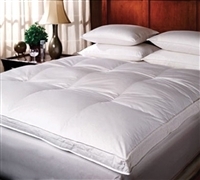 Here you will find our selection of Featherbed Mattress Toppers. These bedding essentials will add the softness and support of either duck feathers or goose feathers for comfort you can't resist and instant relaxation.